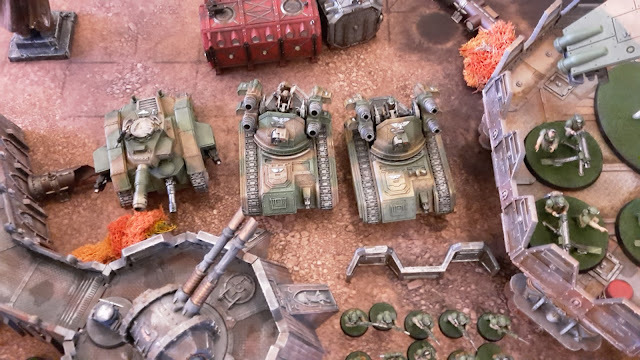 Today I have a new video battle report to share with you, as well as some of my own photos of the game. I was fortunate enough to feature on the Dark Artisan's youtube channel once again. 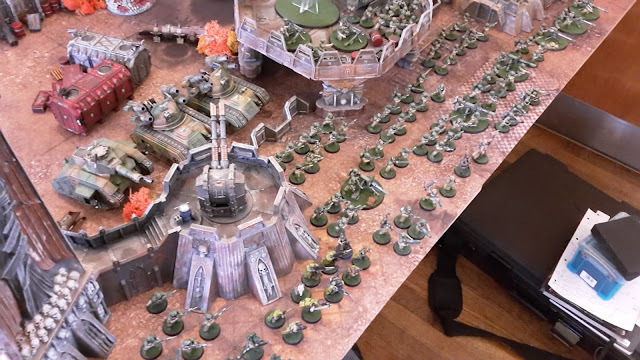 This time, my Astra Militarum army took on Harry's Chaos Space Marines. For my Guard army, I decided to go for an infantry heavy force, backed up by a couple of tanks. The army was led by Commissar Yarrick, who I recently faced at Caledonian Revolution and knew could be very useful in a game. Check out the video and be sure to like the video and leave comments if you enjoyed it. Due to the time constraints of the club night, I was not able to take full notes for writing up the battle report, but did manage to take some photos of the game. 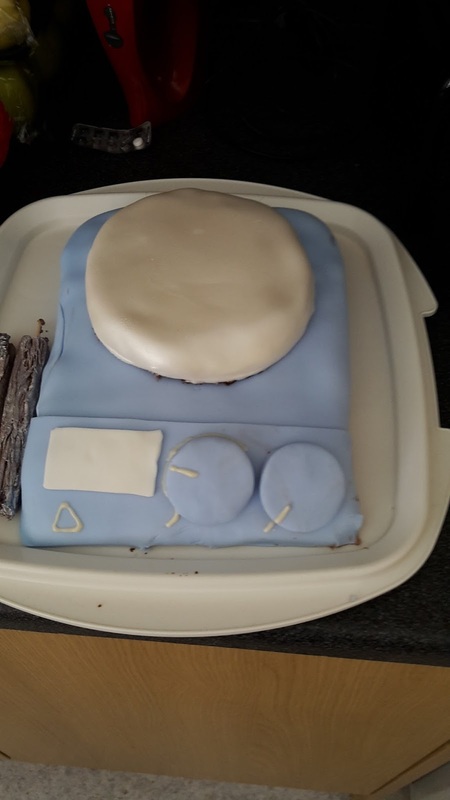 Hello faithful Blog readers, today I have a bit of a random post for you today as I talk about what I have coming up on the blog and where life is at the moment. 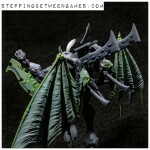 Hobby content has been a bit sparse on the blog at the moment. Part of this is due to real life getting in the way. I am currently in the process of job hunting and trying to sort out life at the moment. My current contract in Newcastle comes to a finish at the end of August, so I have been furiously writing applications for new positions for the past few months. Some of these are starting to come to fruition and I have been on several interviews in the pasts weeks. Needless to say that preparing for these has eaten up a big chunk of my hobby time, as well as missing several club nights thanks to travelling. I also spent last weekend in glorious rainy Perth up in Scotland for the annual Rewind festival. This is an awesome 80s music festival that has been going on the past few years, and this was my fourth year in attendance. 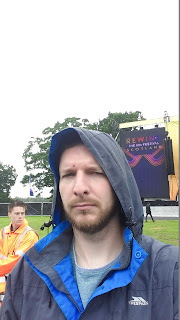 I love 80s music and the festival is an absolute blast. 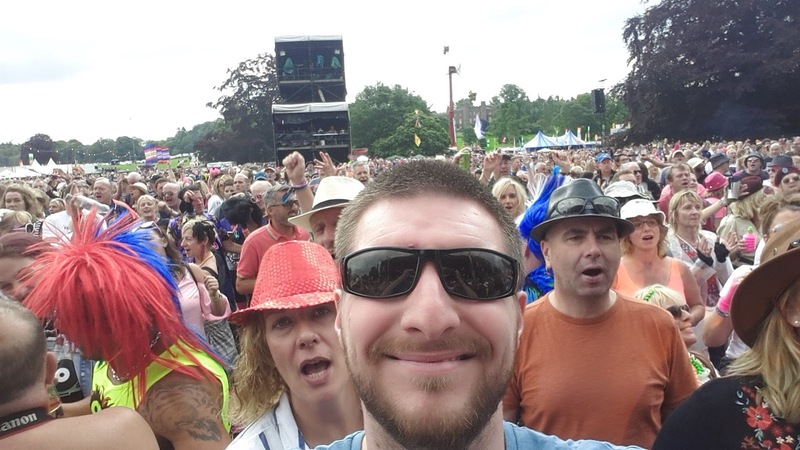 Much more relaxed than other music festivals that I have attended and a really nice atmosphere to party away the weekend. Fun in the Scottish sunshine! The good news is that the next few weeks are going to be great for blogging content. This weekend, I will be attending a 40k tournament at Battle Bunker in Sunderland. This is a great new hobby and gaming store that has opened up in the area. I'm sorry to say that the store has been open for ages, but this is my first time attending an event or gaming there. It is a nice store and I would love to support it, as it gives us a nice gaming centre on the east coast that would be perfect for holding events and tournaments. I may even consider running my own event at some point in the future, if this would be of interest to anyone? 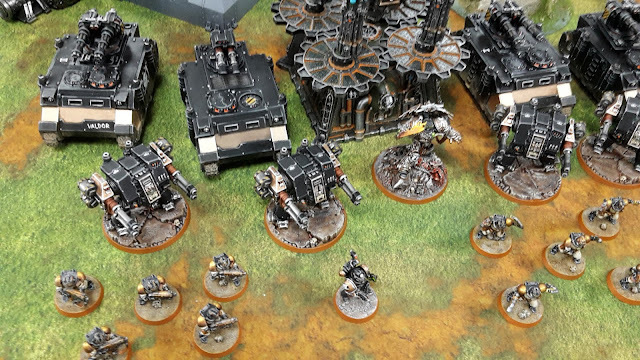 I was hoping to take a new army to the event, but I think it will need to be my Deathwatch once more. Sadly, I just haven't had the time to practice with any of my other armies in 8th edition, but plan to rectify this very soon. I wouldn't want to take an army to a tournament that I was unfamiliar with, never mind not having played a single game with them. Constantly looking up rules and forgetting things would not be great for me or my opponent. I will also be attending the North West Open at Wargames in Stockport the following weekend. Again, time constraints in gaming have meant my Deathwatch will be representing once more at this event. Hopefully, you aren't getting too bored with all the Deathwatch on the blog at the moment. I promise, you will be seeing a bit more variety in the battle reports in the coming months! Random hotplate/stirrer cake that I made recently. 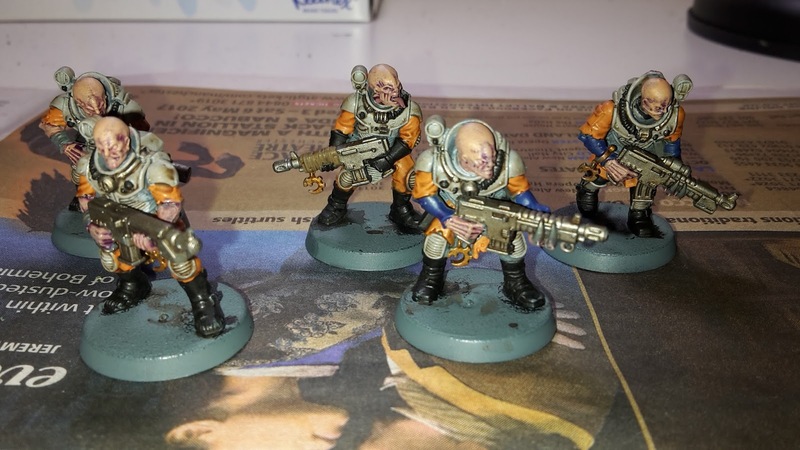 On the hobby front, I am planning to get back to my Genestealer Cults when some free time opens up. I have some unused holiday days to use before the end of August, so maybe I'll be taking a week-long painting holiday next month. The rapid release schedule for 40k codices should also provide some nice content. I am planning on reviewing the new Space Marine codex in fairly quick order once it is released, and will be very keen to play some games with my White Scars army to test out the new book (although, rumours of Khan only being on foot is annoying me a little!). I will also hopefully be getting some more guest posts on the blog as well. 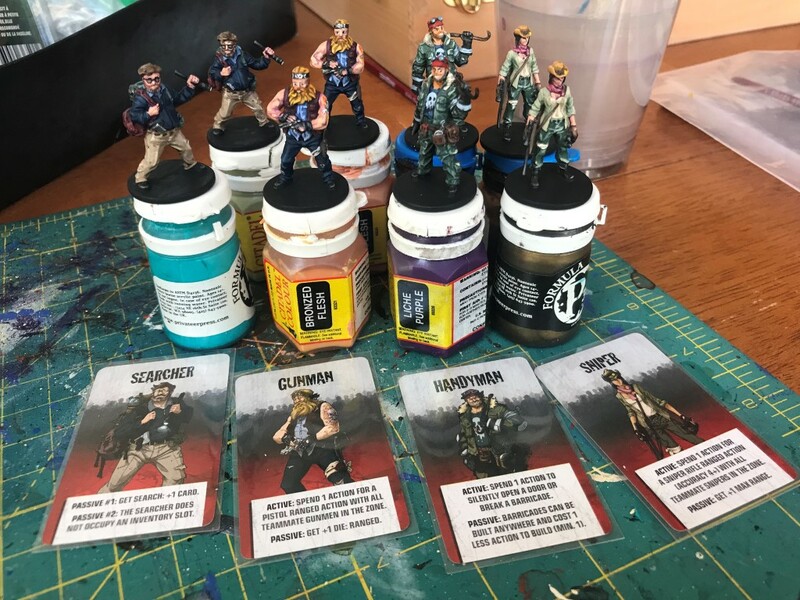 Regular reader and commenter Chris has been in touch about an upcoming Infinity campaign, as well as some battle reports he has been writing. Be sure to check out his previous guest post "Infinite Patience", to get up to speed on the basics of Infinity before the article lands. I also hope to reach out to some more great bloggers for some Better Know A Blogger posts. I was hoping that I could keep this series going with one post a week, which I did manage for quite a while. Things have dried up a bit recently, so I plan to send out a host of new emails to try and get people interested. If you have your own blog and would like to be featured, drop me an email at corrm83@gmail.com and I can get it sorted. An idea that I was toying with before was contacting previous participants for a "follow up" post with some new questions. I'll need to have a dig through my older posts to see what questions the blog readers came up with and start putting things in motion! As you can see, a lot of things on the go for St Andrews Wargaming. A new job will probably necessitate another move, but hopefully I can find a place with more great gaming clubs to continue to bring you battle reports and more hobby goodness. Recently, I attended the Caledonian Revolution tournament, the first one that I had attended for 8th edition. 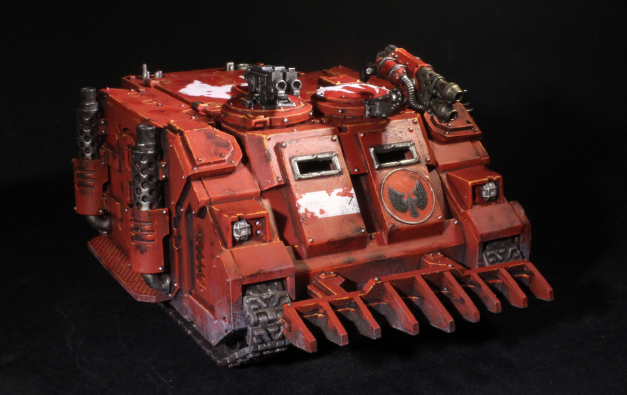 I had been to quite a few tournaments in the past edition and was interested to see how I would perform with such a drastic change to the rules of 40k. 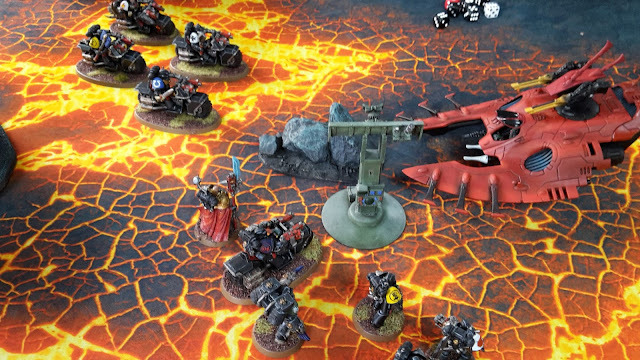 Since the release of 8th edition, many players have spend time building new lists for their armies and testing out what units worked and what units were less effective. Caledonian Revolution featured around 100 players, with many top level players from the UK attending, so this seemed like a good place to check out where the meta might be heading. 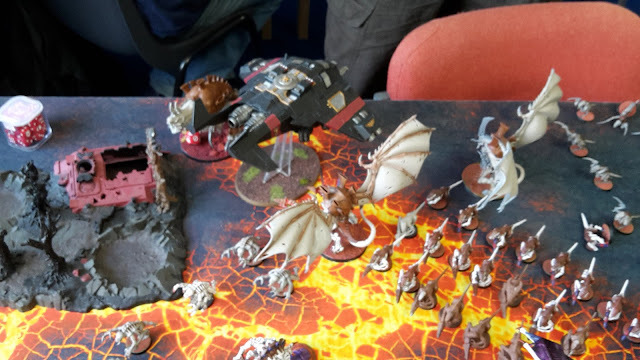 Going round the tables at the tournament, there were quite a few trends that I noticed. Flyers were very popular, with many lists featuring multiple flyer units. 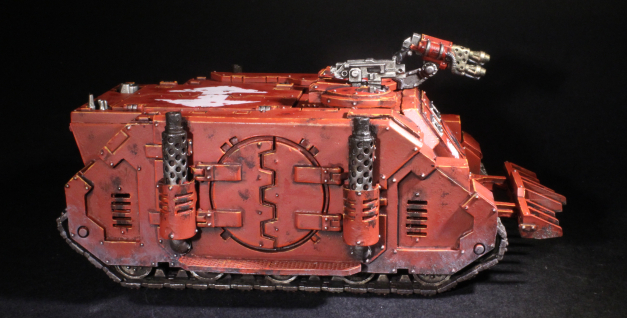 Vehicles were back in a big way too, with many list featuring a lot more tanks than you would expect under 7th edition, and even Dreadnoughts were being taken. In fact, many lists had up to 5 or 6 Dreadnoughts in the army. 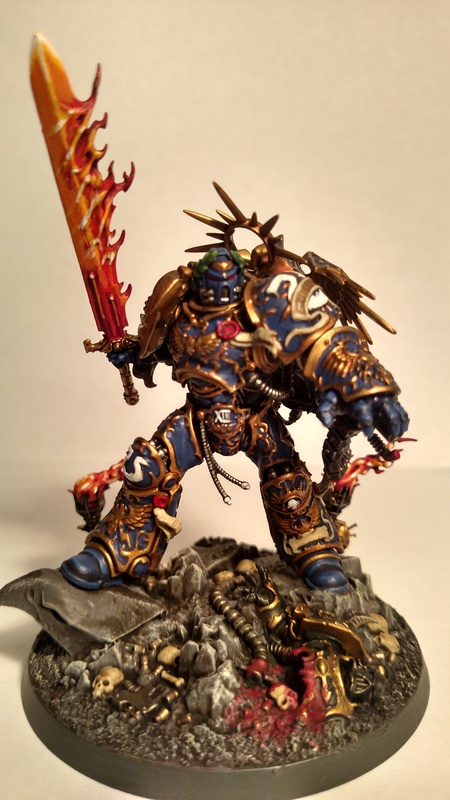 Guilliman was also a common sight on the table, as well as veritable hordes or Razorflocks! 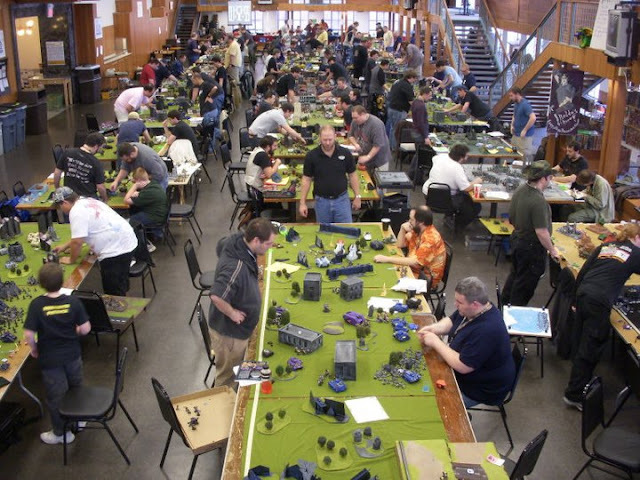 I was interested to see what tournament players thought of 8th edition and how it might shape the tournament scene going forward. 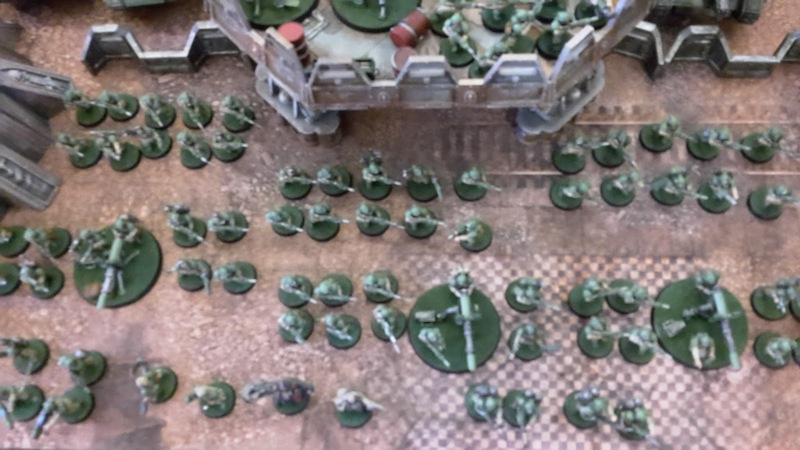 I asked previous contributor Innes to put together some thoughts of his experiences of 8th edition so far. I used to play against Innes when I attended Dundee Wargames Club. 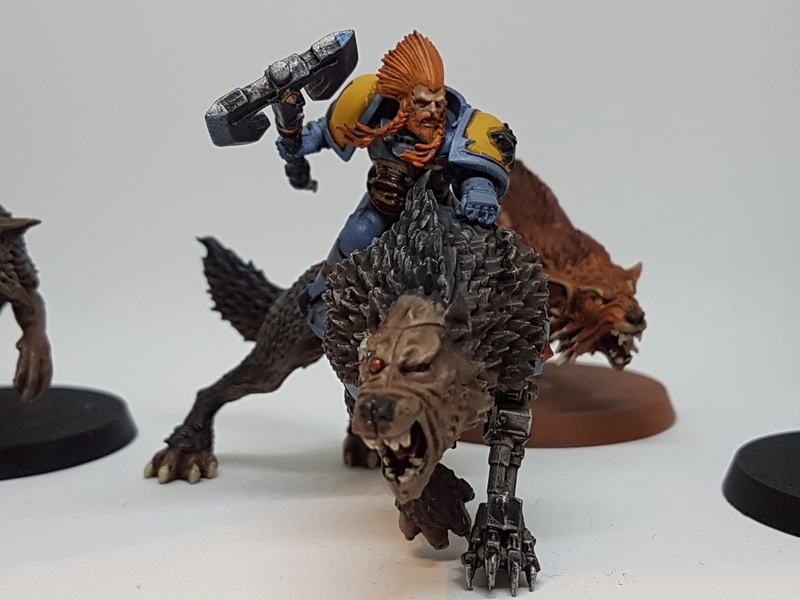 He was very much a big fan of tournament games and would be frequently trying out the optimal combinations for his army that stretched the rules of 7th edition to breaking point. We had a lot of fun games, some not so fun games against his Deathstar army, and I learnt a lot about making fun lists for my White Scars that could also be competitive in a tournament. Innes attends countless tournament each year, is a member of the ETC Scottish team and is a co-host of the awesome Caledonian Deathwatch radio, a great podcast for getting information on 40k from a competitive viewpoint. Check out their facebook page for all the up to date information on the podcast. Hi everyone, Innes here. Following Caledonian Revolution, Michael asked me to put together an article about what I thought about 8th as a tournament edition, so I’ve put together a short piece on the strengths and weaknesses of 8th Edition for tournament play. For me personally, I was a massive tournament player in 7th, and I very much enjoyed all the game had to offer in terms of list building, tactical depth and options available; whether it was in the psychic phase, or the intricacies of multi-charging and list design. Moving into 8th then, it became obvious from the articles that Games Workshop were attempting to reduce the level of over complication in the game. As a person who thrived on that over complication, I’ve been very much concerned about where 8th edition would be as a game for tournaments. There were some great armies present at Caledonian Revolution this year. First up, you can see some of the armies that were nominated for Best Army at the event. As is customary for each of the tournaments that I attend, I will take a look at the army I selected for the event, identify which units worked well and which units struggled, and try to learn some lessons from my games at Caledonian Revolution 2017. First off, I won two games and lost three games at the event, gaining a final listing of around 66th out of 100. This is easily my worst result at any of the tournaments that I have attended in recent years. 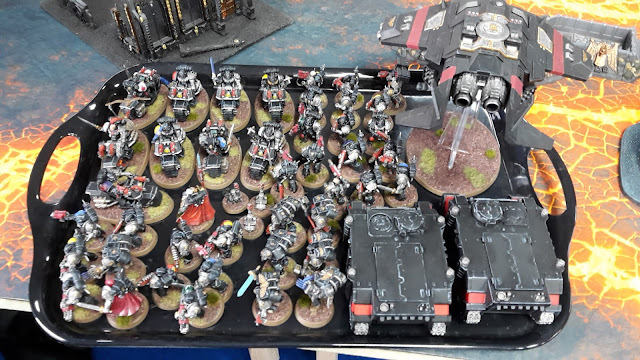 It is a little disappointing, but is mitigated slightly by the fact that 8th edition was only 2 weeks old when I attended, so I had little time for fully playtesting the army and going up against a range of armies to see how the Deathwatch performed against them. 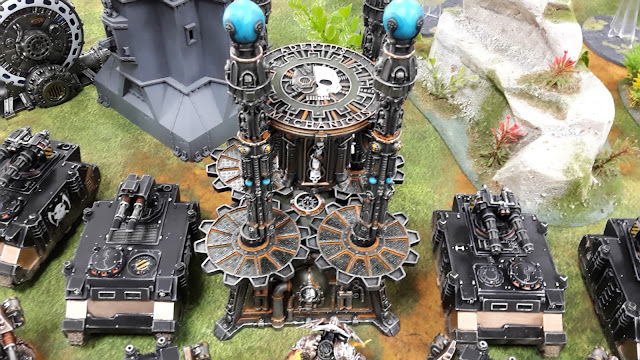 This was more than made up for by getting a nomination for Best Painted Army at the event (see, I told you I was going to keep mentioning it!). When I built the army, I thought it would function as quite a nice, generic, take all comers list. With the little playtesting that I did, I had to add the Meltagun squad, as I had a serious lack of anti-armour firepower in the force. I will now break down each unit and see what worked well on them. The final game of Caledonian Revolution 2017 saw my Deathwatch take on Craig's Tyranids. Game 5 featured the Scouring as the Eternal War mission, with Cleanse and Capture as the maelstrom mission (three cards per turn). The deployment zone was Vanguard Strike. 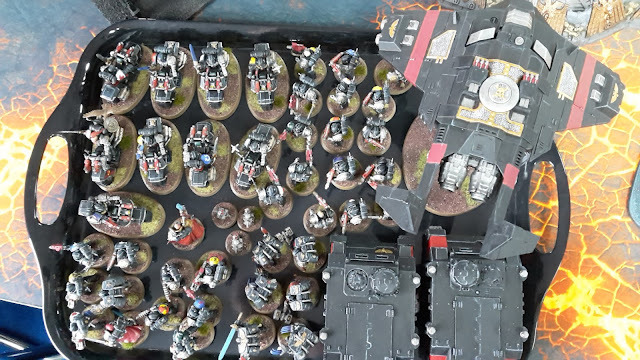 I had yet to play a horde army with my Deathwatch yet, so would be interested to see if I had the firepower to take them out before they could reach me. My warlord was the Watch Master, who took the Legendary Fighter warlord trait. 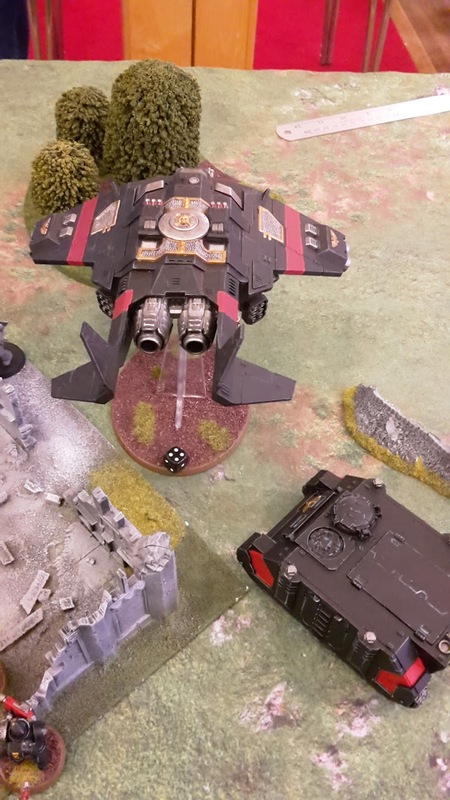 The first game of day 2 of Caledonian Revolution 2017 saw my Deathwatch take on Jonathan's Craftword Eldar army. Game 4 used the Relic as the Eternal War mission, with Spoils of War as the maelstrom mission (3 cards per turn, you can steal your opponent's "Secure Objective X" cards). 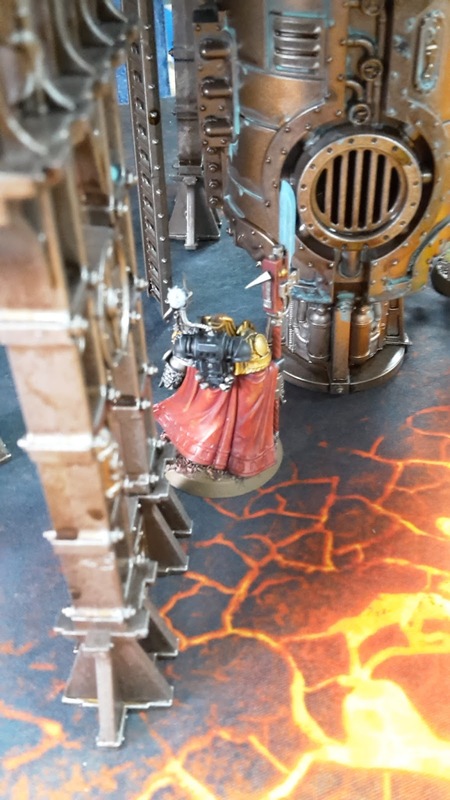 In a modification to the Relic, you scored 8 points for holding the Relic at the end of the game or 4 points if you controlled it (had the most models within 3") and no-one held it. 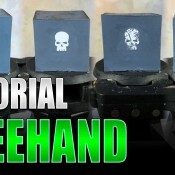 The deployment map was Hammer and Anvil. The final game of day 1 of Caledonian Revolution saw my Deathwatch take on Joel's Space Wolves. Game 3 featured Secure and Control as the Eternal War mission (one main objective each) and Deadlock as the Maelstrom mission (6 cards, decreasing each turn). The deployment map was Search and Destroy. My Warlord was the Watch Master, who had the Legendary Fighter warlord trait. Game 2 of Caledonian Revolution 2017 saw my Deathwatch taking on John's Astra Militarum army. 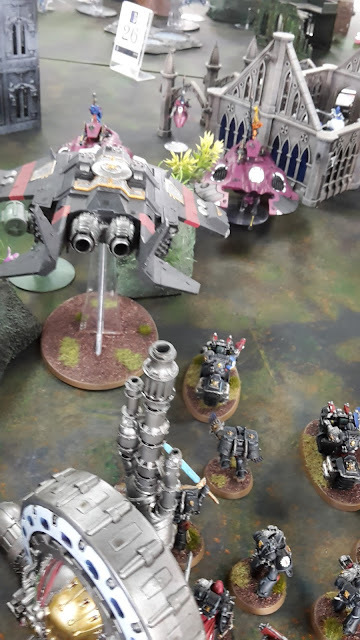 The misssion for game 2 was Big Guns Never Tire for the Eternal War, Tactical Escalation for the maelstrom mission and Dawn of War deployment. Welcome to my first battle report from the recent Caledonian Revolution 2017 tournament. The weekend features five games of 8th edition 40k, with 2000 pts armies. I decided that I would be taking my Deathwatch army. 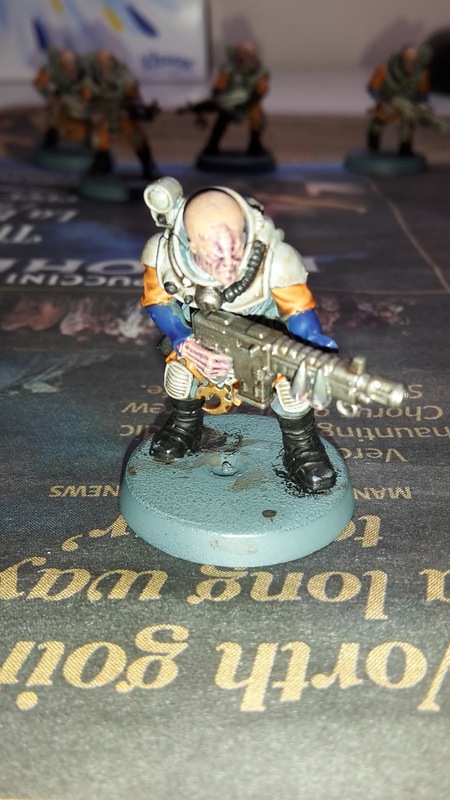 I had been having fun with the army towards the end of 7th edition and had made a real effort to get them painted to a higher standard than my previous forces. Each of the five games were to ETC standards, meaning that each mission would be a mixture of Eternal War objectives, Maelstrom points and Kill Points, as well as bonus points for First Blood, Slay the Warlord and Linebreaker. The first mission was Retrieval Mission (4 objectives), with Contact Lost for the maelstrom mission (one card for each objective held). The deployment zone was Spearhead Assault. My first opponent of the day was Tess and his Ynnari army. I had previously played Tess at Blog Wars X in a really fun game. I hoped that this would be another fun encounter. I figured I had a good mix of units to take on most threats in an opponent's army. I added some potent anti-tank firepower after my first few games had showed a serious problem taking on vehicles. 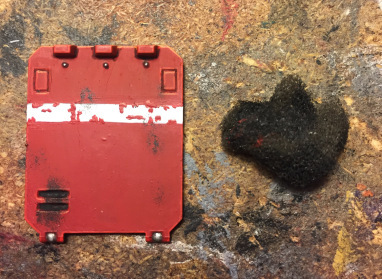 This week's battle report sees my Deathwatch take on Andy's Blood Angels in a straight up, Kill Points slug fest. Andy and I played the No Mercy mission for our 2000 pts game at the Newcastle Warlords gaming club. Andy was new to the club, so I was hoping he would have fun playing against both my Deathwatch and my fickle dice rolling! 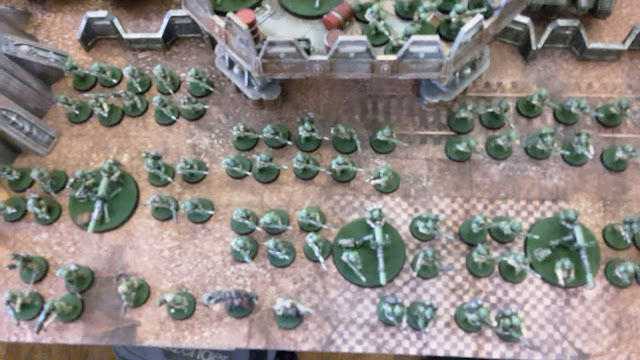 After my last game, I decided to change up my army. 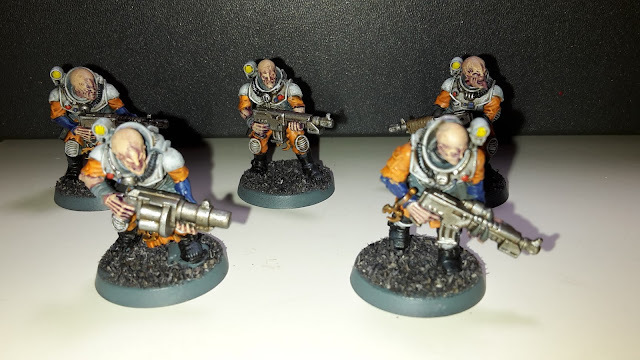 I added a couple of Frag Cannons to the squad in the Corvus Blackstar for some added firepower, as well as adding a Vanguard Veteran and Biker to the squad. This would allow me to fall back and still shoot and assault in my turn, a pretty powerful combo. I also added some much needed anti-tank firepower with a squad of Veterans armed with Melta weapons. These would go in the Rhino to get them up the field quickly. The other squad had two Frag Cannons in another Rhino. 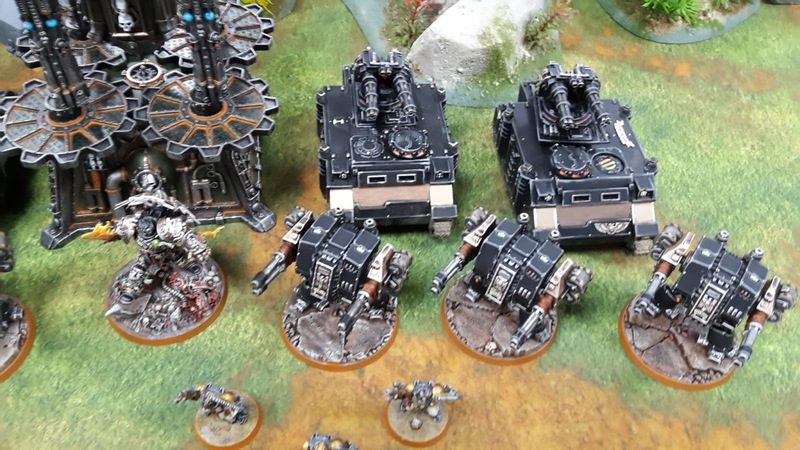 I also had two squads for objective holding; one with Stalker Bolters and another with normal Bolters and a Terminator with Cyclone Missile Launcher for some more tank-hunting capabilities. I also added a Captain with a Jump Pack. This would give the second character some much needed mobility. 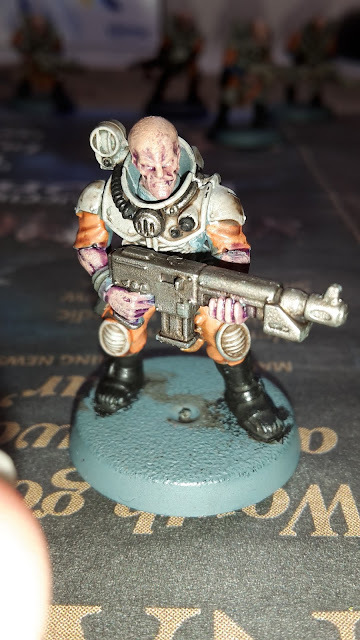 I figured I could use him with the Bikers or with the Meltaguns to give me some re-rolls for shooting. The Watch Master would go in the Corvus with the squad, for those important re-rolls. He was my Warlord and took the ignore wounds on a 6+ trait. Finally, I took two squads of four Bikers and a Corvus Blackstar. The Bikers came with a range of Power Weapons for dealing with different squads. This weekend, I attended Caledonian Revolution at Element games in Stockport. It was a great weekend, as I got to meet up with some friends from previous events and play some great games of 8th edition. 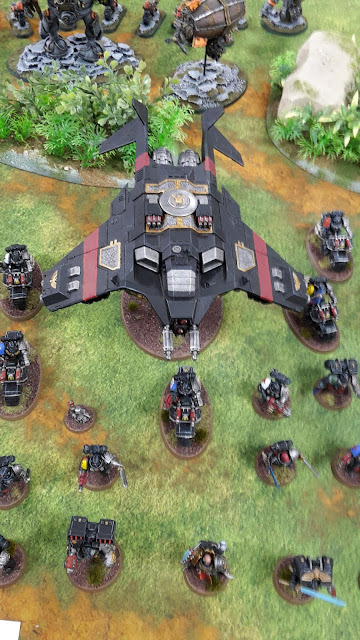 I will be writing up my battle reports from the tournament and hope to have them ready for next week. Today though, I wanted to share with you some other awesome news. My Deathwatch army was nominated for Best Painted Army at the event. 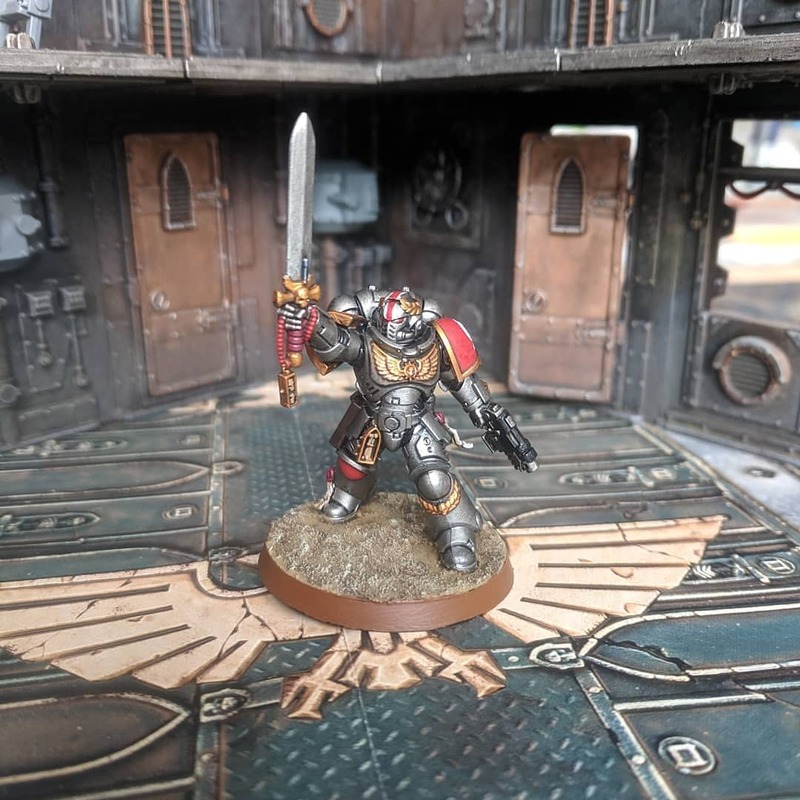 Needless to say, I was thrilled to be nominated, especially after all the effort that I have put into the Deathwatch army, and really trying to improve my painting skills with the force. Sadly, I did not place in the top three, but when I post the photos of all the nominated armies, I can understand why. There were some fantastic armies on display at the event. 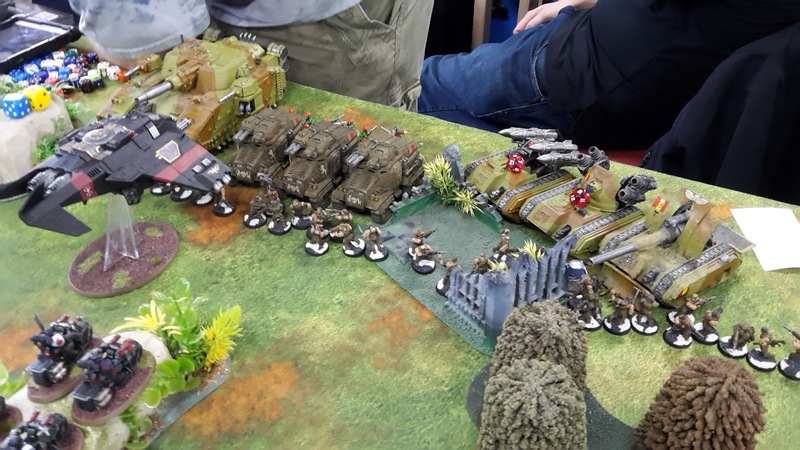 (Sorry for the shoddy photographs below, the tables around the armies was really busy and I didn't have long to try and get photos). This week's Hobby Sunday sees me complete my first half squad for my Genestealer Cults army. For the scheme, I followed the Warhammer TV "How to paint Genestealer Cults- Neophyte Hybrids" video. You can find the first part of the painting in an earlier post.